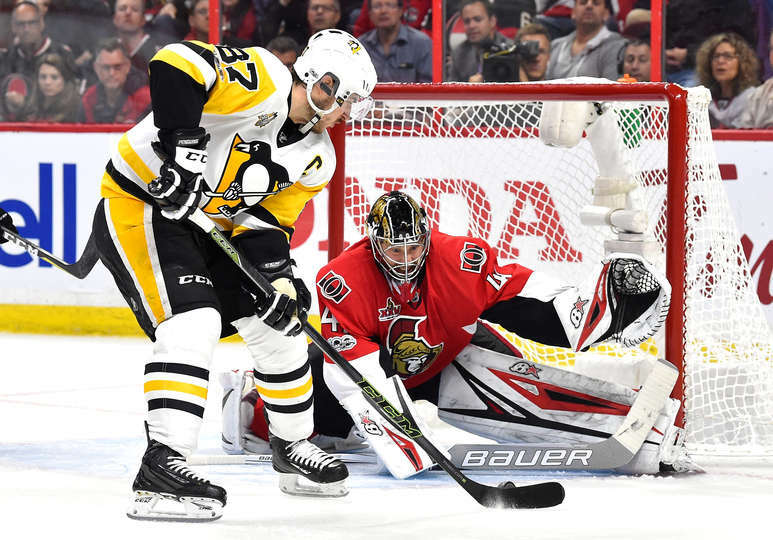 OTTAWA — Craig Anderson made 45 saves to help the Ottawa Senators avoid elimination with a 2-1 win against the Pittsburgh Penguins in Game 6 of the Eastern Conference Final at Canadian Tire Centre on Tuesday. The best-of-7 series is tied 3-3 with Game 7 at Pittsburgh on Thursday. The winner will advance to the Stanley Cup Final against the Nashville Predators with Game 1 on Monday. Anderson was pulled from a 7-0 loss in Game 5 on Sunday after allowing four goals on 14 shots. Mike Hoffman scored 1:34 into the third period to break a 1-1 tie. “We were off (in Game 5). Obviously myself, I was terrible,” Hoffman said. “Every mistake we made they scored on. They’re a team that can do that to you. It was a big bounce-back game for myself and everybody in here. Anytime you lose by a touchdown, it’s not nice, especially in hockey. It was definitely a big bounce-back game. Evgeni Malkin scored and Matt Murray made 28 saves for the Penguins. After Malkin gave the Penguins a 1-0 lead at 4:51 of the second period, the Senators ended an 0-for-29 streak on the power play to tie the game during a 5-on-3 advantage. Ron Hainsey was called for interference at 11:45 and Ian Cole was penalized for high sticking Senators center Kyle Turris at 12:21. Bobby Ryan tied it 1-1 at 13:15 when he took a pass from Turris in the left circle and swept a shot past Murray on the stick side. It was Ottawa’s first goal on Murray in 98:16 in the series. He won Games 4 and 5 after returning from an injury sustained before Game 1 of the first round. Trevor Daley swept the puck into the net for Pittsburgh at 3:04 of the second during a scramble in the crease. But the Senators challenged for goalie interference and the goal was overturned upon review. Hoffman took a pass from defenseman Fredrik Claesson on the left wing and scored with a slap shot that went in off the right post. Malkin fought off Senators forward Zack Smith along the end boards and spun out for a shot on goal. The Penguins center got his rebound and slipped a backhand behind Anderson. The Senators were 3-for-3 on the penalty kill after allowing five power-play goals on 14 chances in the first five games of the series. The Penguins are 9-7 in Game 7, 3-7 at home. The Senators are 0-5 in Game 7, 0-4 on the road. … Karlsson, who has 14 assists in 18 Stanley Cup Playoff games, is one shy of the Senators record for most in a postseason, set by forwards Dany Heatley and Jason Spezza in 20 games in 2007. … Senators forward Colin White played 2:39 in his Stanley Cup Playoff debut.